WASHINGTON ?NASA chief Charles Bolden's plan to visit China this month forhigh-level talksabout possible cooperation on human spaceflight has prompted a seniorRepublican appropriator to request a security briefing on the tripbefore ithappens. In an Oct. 5letter to the NASA chief, Rep. Frank Wolf (R-Va.) said he strongly opposes anypartnership with Beijing that involveshuman spaceflight,including efforts to involve China in the international space station. "I neednot remind you that no such planning or coordination has been approvedby theCongress," wrote Wolf, the ranking member on the House Appropriationscommerce, justice, science subcommittee that oversees NASA spending. "Infact, several recent NASA authorization bills have explicitly sought toplacestrict limitations on coordinationwith China." Wolf, anoutspoken China critic, is likely to return to the chairmanship of theNASAappropriations subcommittee next year if Democrats lose control of theHouse inupcoming November elections. 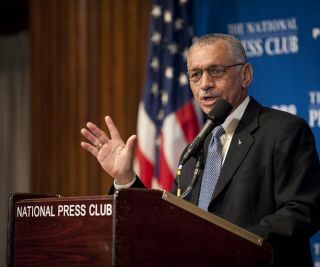 In his letterto Bolden, Wolf cited a Sept. 27 Aviation Week and Space Technologyreport thatrevealed details of the trip, currently planned for Oct. 16-21, and anOct. 1NASA white paper the lawmaker said downplays the trip's significance. "Itshould go without saying that NASA has no business cooperating with theChineseregime on human spaceflight," Wolf wrote. "China is taking anincreasingly aggressive posture globally, and their interests rarelyintersectwith ours. The U.S. intelligence community notes that China's attemptsto spyon U.S. agencies are the most aggressive of all foreign intelligenceorganizations. China's aerospace industry for decades has providedmissiletechnologies and equipment to rogue regimes like Iran and North Korea." According tothe Oct. 1 white paper, Bolden's visit will involve "initialdiscussionswith the China Manned Space Engineering Office" and site visits tohumanspaceflight facilities. "Thiswill be introductory and will not include consideration of specificproposalsfor human space flight cooperation," the white paper states, addingthatChinese government officials are expected to pay a visit to NASAfacilities inNovember. The UnitedStates and China agreed to the reciprocal visits last November duringPresidentBarack Obama's visit to Beijing. Bolden wouldnot be the first NASA administrator to visit China. His predecessor,MikeGriffin, led a NASA delegation there in 2006 to meet with Chinese spaceofficials. The NASAwhite paper says potentialengagement with China in the area of human spaceflight wouldbe conditionedon the transparency of the communist country's space activities. Thewhitepaper also says bilateral cooperation is consistent with new guidancecontainedin the U.S. national space policy issued by the White House in June. The policycalled for NASA to "expand international cooperation on mutuallybeneficial space activities to: broaden and extend the benefits ofspace;further the peaceful use of space; and enhance collection andpartnership insharing of space-derived information." In hisletter, Wolf reminded Bolden of written testimony provided to thesubcommitteeearlier this year in which the NASA administrator assured lawmakers theagencyhad not had "any human spaceflight-related discussions" with China. Wolf calledfor a briefing to the Congress on the nature of the planned discussionswithChinese officials and asked that Bolden respond in writing to clarifythe scopeof the "introductory" discussions scheduled to take place. "Specifically,please provide a summary of information about the U.S. humanspaceflightprogram that will be provided to the Chinesegovernment, includingnon-public technical,operational or strategic information," Wolf wrote. "I wouldappreciate a detailed list of the NASA facilities that Chineseofficials willbe invited to visit, including a summary of the security precautionsthat willbe put in place to protect sensitive spaceflight information." Thisarticle was provided by Space News, dedicated to covering all aspectsof the space industry.